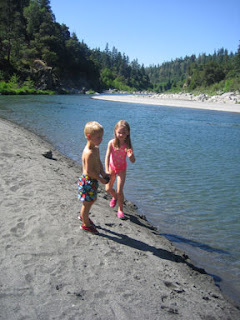 Every child should have a river in their backyard to frolic in, and we are fortunate to have a tributary of the Klamath River below our house. The Klamath River is a sick river, like many rivers in our country, and four dams contribute greatly to the problem. Toxic algae blooms make it unsafe for swimming in late summer, as well as warm river temperatures caused by the dams and water diversion have caused massive fish kills. Up to 90% of Klamath tributary water flows has been diverted in some years to farmers growing subsidized potatoes and beets, but new regulations are changing this somewhat. The dams are the problem, and Pacific Corp, a Warren Buffet company that owns the dams, is currently in their 50 relicensing phase on the dams. The courts have ruled that the fish must be protected by fish ladders or dam removal. Dam removal is the cheapest and most ethical option; however, Pacific Corp has suggested the fish be trapped and trucked around the dams. In addition, the native people are suffering greatly from the loss of this crucial part of their diet. I understand the plight of the farmers; however, couldn’t our government subsidize them not to grow? The fisherman didn’t receive any subsidies for the closed salmon season last year, but they were offered low interest loans if they would use their boats as collateral. The river is a big part of our life. We constantly watch its levels rise in winter and enjoy its cool water in the hot, summer months. Both of my blessing ways were held on the black sandy shore, as well as every birthday party for my children. Our family is also financially supported by sustainable ocean fishing, of which didn’t exist last year due to low numbers in the Klamath River. You can help save the Klamath! It is time to make some noise! You can take action at American Rivers!